My daughter absolutely loves everything My Little Pony! For her birthday, she planned out an entire My Little Pony-themed party all on her own, including some My Little Pony Bingo to play with her friends at the party. Of course, I obliged, and here is the free printable to share with you! 2. Give each player a Bingo card and markers. Have each player put a marker over the free space. Yay!!! Can't wait to play this with my little girl who loves her Ponies! Thank you for this! AHHH! My kids would go nuts for this! THANK YOU!!! Will be using for my daughter's B-Day party! She is so excited! Thank you for sharing this! I'm sure it will be at hit at my daughters birthday party!! Thank you so much for sharing this with us. My daughters 5th birthday is Sunday and the kids are going to love this !!!!! It is great!!! How do you call the images? Just for the image? Not using the letters from the bingo?? I'm looking forward to using this at my daughter's party. Thanks so much! Can this be used for more than 8 kids? I wanted to thank you for such a cute free printable. They are perfect for my little girl's party! Thank you for sharing HUGE hit! As a pegasister, I love mlp:fim too!! I wasn’t into the 80’s ponies. Another pegasister got me into mlp:fim. Since I’m an adult who loves them, I often feel embarrassed, but found out mlp:fim is very popular! Your daughter has a very creative imagination. 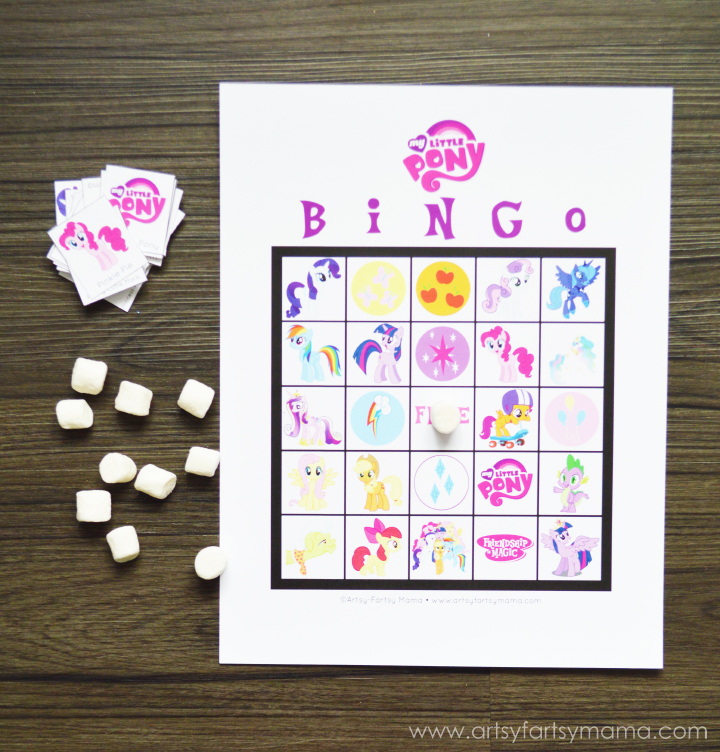 I made a mlp bingo chart too & I used mlp stickers & made my own cards. I played w my Mom. We loved it. I’m always looking for new mlp activities. Or maybe I can share some of mine w your daughter. I made my own mlp jigsaw puzzle & mlp memory as well. Take care.